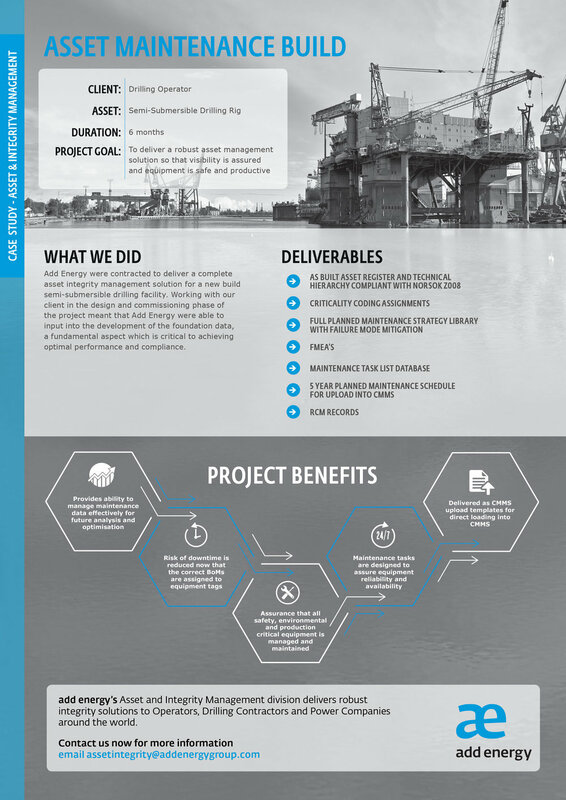 Add Energy were contracted to deliver a complete asset integrity management solution for a new build semi-submersible drilling facility, with a primary aim of providing total assurance that equipment is safe and productive. Working with our client in the design and commissioning phase of the project meant that Add Energy were able to input into the development of the foundation data, a fundamental aspect which is critical to achieving optimal performance. The project saw Add Energy deliver a fully comprehensive asset register and technical hierarchy, equipment criticality assignment, a library of optimised maintenance strategies, maintenance task list databases and 5 year PM schedule. All of which were delivered in the Computerised Maintenance Management System (CMMS) upload templates for direct loading into the CMMS. The build covered over 35,000 equipment tags and was executed remotely by Add Energy’s team in Aberdeen, taking only 6 months to complete.